Two classes. One for teens and one for adults. Cut paper is both an ancient tradition in many cultures around the world and an exciting new medium increasingly seen in contemporary art. 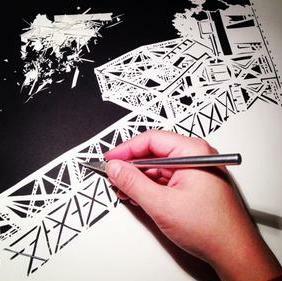 This course will give participants an introduction to the art of cut paper and will result in the completion of an original “paper cutaway” composition of a subject of their own choosing. This relaxing and fun process yields striking work in its beautifully rendered details and unique aesthetic. Participants are encouraged to bring or have digital access to their own photos or drawings (the more detail the better) which will be formatted and printed in 8 x 10 inch size during the workshop if needed. Materials provided. Sunday, June 5 in the Education Station, Building 9, on the TwispWorks campus. For ages 18 and over.